If you’ve been a Windows user for a while,chances are, you’ve seen dll files and errors associated with them. Chances are, you also are aware that you cannot “double-click” dll files to run them, or just run them at the commandline. DLL files are technically still executable files because they house executable binary code and in fact, they are of the same format as a .exe file is. The main code differences are there is a bit set in DllCharacteristics of the file’s PE header and there are also exported functions rather than a typical main/WinMain function which starts when a .exe file is run. The main technical difference that differentiates DLLs from EXE files is the loading process. In a regular EXE, when a user double-clicks the file, the Windows PE Image Loader parses the PE headers, performs some integrity checks, and sets up all of the memory sections for the file. These memory sections include the .text or .code section, the .data section, .rdata section, and more. In fact, other, non-standard sections can be added if a programmer desires. These sections, when mapped (loaded) into active RAM, may not be mapped in the same position they were in sitting in the PE file on disk. The important thing to note is that DLL files have most of these same traits (multiple sections, PE header, etc..) except that the Windows PE Loader will not load them directly for a user. The purpose of DLL files is to be a collection of functionality (a “library”) that other programs can utilize. Thus, programs can directly load DLLs in a variety of ways; one way being using the API calls LoadLibrary or LoadLibraryEx, followed by GetProcAddress to locate the address of a specific function in the DLL. This is essentially what rundll32.exe does when it is passed a dll file and function as arguments. This is also why we often see LoadLibrary and GetProcAddress used in malware which implements its own custom loader to load up DLLs which were not specified in the PE Header. The morale of the story is that another program is needed to load a DLL file. 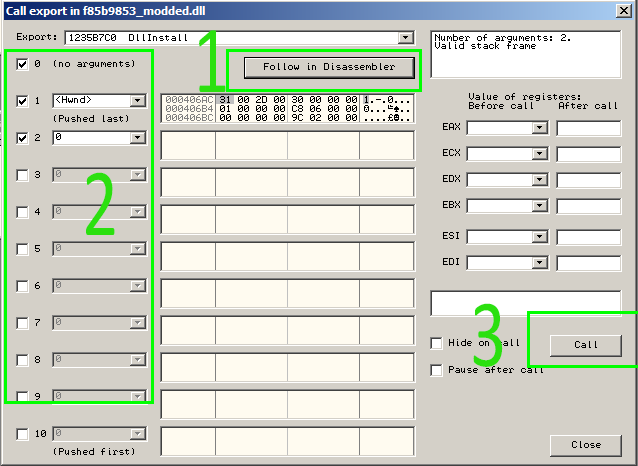 We will cover 3 separate ways using 3 separate programs which can be used to load DLLs in this post, as well as instructions on how to load them. 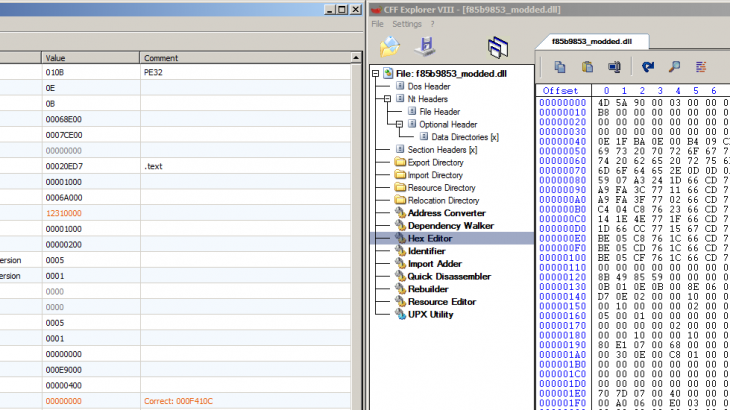 Here the PE parsing tool Professional PE Explorer aka Puppy is used to display the DLL exports. Notice how each has a name, ordinal, and relative virtual address (RVA). These ordinals are arbitrary and do not necessary follow a standard format between different DLLs. Unfortunately with rundll, passing in arguments to functions can get tricky so there are some limitations on which exported functions we can call this way. One limitation is that the calling convention of the function must be _stdcall. There are a few other limitations listed on the Microsoft Support page. The biggest caution here is that when rundll32 fails, it may not notify the user so the user may think the function is simply not working when in reality, rundll32 was supplied improper arguments. The purpose of doing this to analyze files requires an analyst to first have dynamic monitoring tools running and ready to go. 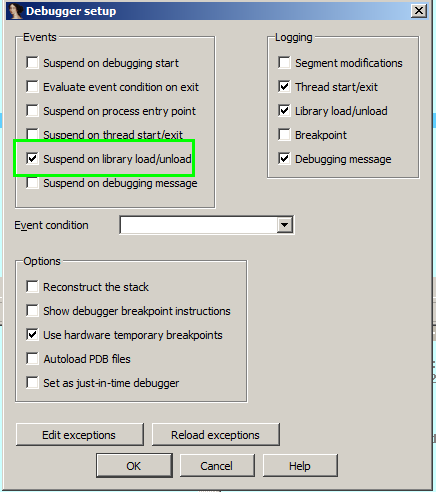 So before executing a rundll32 call to a dll, start up the necessary monitoring tools like ProcMon, Process Explorer, Process Hacker, Wireshark, etc… Once the DLL is executed, remember to watch the behaviors of rundll32.exe instead of the dll file directly and then turn monitoring off and analyze using the tools shortly thereafter. Most of the time, these types of loaders must be accessed from a menu, which can add to the confusion of beginning analysts since the file will not simply break at the start like a .exe file does. To access the loader options in OllyDbg, open up a DLL file and choose yes to have it loaded, then go to Debug -> Call DLL Export at the top of your OllyDbg window. This is only available if you’ve opened a DLL file inside OllyDbg. As you can see, OllyDbg allows you to jump to the function’s assembly code as well as even pass arguments to the function as seen in item 2. Finally, the Call button at the bottom right (#3) invokes the function so that EIP is now pointing at the start of it and the analyst can debug as if the file were a normal exe from this point. The setting that we just set in the previous step allows us to now press F9 repeatedly and see each new “module” as it is loaded into Rundll32.exe. Note that a “module” is another name for a DLL file. So, the idea now is that we continue to press F9 until we see the DLL we want to analyze appear in that window and we do not press F9 past that point! IF you accidently press F9 too many times, you will have to start over to get back into the DLL’s code. 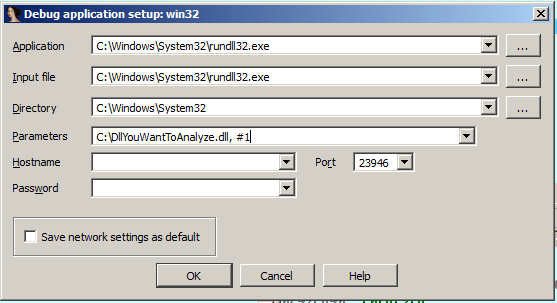 Once the module has been loaded, double click it in the module’s window shown above to be taken to its entry point, press F2 to place a breakpoint on an instruction there and congratulations, you can now analyze the malicious code inside of the DLL which is being executed by rundll32! 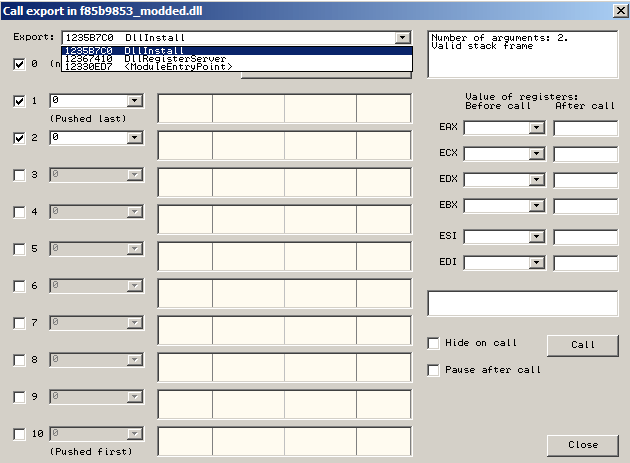 Malware Research Team, TechTalk Slider DLL files, dynamic analysis, Malware Research, rundll32. permalink.